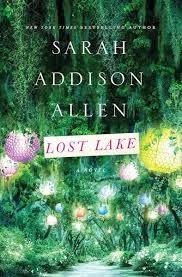 I know there is much love for Sarah Addison Allen's previous books, but unfortunately I never got a chance to read them. So when this landed in front of me in December and I wanted a good comfort read, I dove right in. I loved this book! I thought it was really beautiful and sweet and hopeful. Which well may be words that turn you off, but eh, what can I say? These are the things this book was to me. This book is about Kate who lost her husband and has struggled to really go on living. She's heavily dependent on her mother in law for taking care of her daughter and finally one day she realizes she does want to live! Her daughter finds a postcard that was lost from an old relative and the two of them skip town to rediscover a place where Kate spent one magical summer when she was growing up. Kate gets reacquainted with her family and we meet a cast of fun and interesting characters. There's a touch of magical realism, a little bit of romance, and a huge helping of hope. One of the things that really resonated with me was the particular kind of grief Kate has. She's not only grieving her husband, but also the relationship they had. At one point, she realizes she'd been the more invested party in a relationship for so long and she had begun to resent it. I think it's a hard line to walk in romantic fiction--you don't want to write off the other relationship as "not good enough" or not the right one or somehow ~less than in order to validate the new one, but since it centered so heavily on Kate, I didn't mind and I think it was pulled off well. And that line totally pinged me because I think it's an inevitable consequence of feeling more invested and there's really nothing you can do about it. You can't make someone love you more, but at the same time you're going to start to have feelings about it. And so Kate was waking up to that realization and dealing not only with the loss of her husband, but her complicated feelings about their relationship and acknowledging the reality that it would never be different. Aw, I feel so sad just writing about it! But that is hardly the biggest part of the book at all, it's just a part that spoke to me a lot. There are other characters coming to terms with their lives! I really enjoyed this read!